It's April 1st again -- also known as April Fools' Day. Today also represents Apple's 36th anniversary, having been founded on this day in 1976 by Steve Jobs and Steve Wozniak. 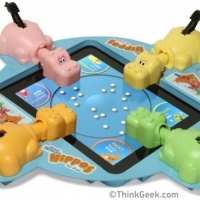 Here are a couple of the more ambitious pranks floating around the internet today: Hungry Hungry Hippos for iPad ThinkGeek has introduced a modernized version of the classic Hungry Hungry Hippos game for the iPad, but now with "capacitive-padded heads." Electronic Hungry Hungry Hippos iPad Game is everything you remember about HHH. All four hippos are present and hungry, except this time, the hippos fit over your iPad and the game board is an app! 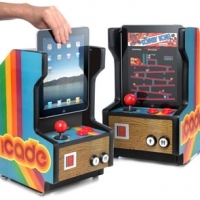 Readers will remember that ThinkGeek first introduced the iCade as an April Fools prank that later became a shipping product. 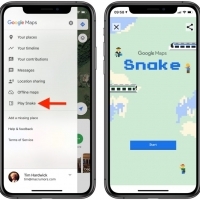 Google Maps for NES Google has created an 8-bit version of Google Maps for the NES platform - a cartridge based game console from the 1980s. You can explore it yourself on Google's maps site. Today is April 1, 2011 and represents April Fools' Day -- so readers should be wary of hoaxes and claims at both news and rumor sites today. Today also represents Apple's 35th anniversary, having been founded on this day in 1976 by Steve Jobs and Steve Wozniak. 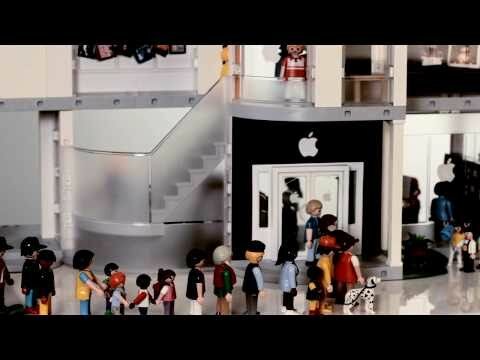 Among the popular April Fools' Day jokes making the rounds today: - ThinkGeek is offering a Playmobil Apple Store Playset with an available "Line Pack" of extra figures to allow kids to accurately simulate the Apple retail store experience. 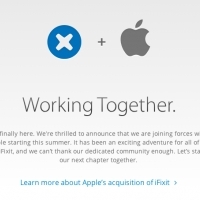 - Self-repair proponents iFixit have actually released an iPhone 4 Oppression Kit for those customers whose devices have standard Phillips screws and who find those screws too easy to remove. With the new iPhone 4 Oppression Kit, users can replace those screws with Apple's new pentalobular screws, making it nearly impossible to open their iPhone if they lose the compatible screwdriver included in the kit. - Google is debuting Gmail Motion a new Gmail interface that takes advantage of the user's webcam to interpret gestures and other motions for controlling Gmail. Google has of course rolled out a number of other April Fools' Day features from its different product teams, including a "1911" YouTube filter that turns any video into a sepia-toned silent film. MacRumors does not participate in April Fools' Day prank news stories, although we have in the past occasionally supplemented our coverage with such special features as a Big Bunny Bundle and Page 3 rumors. Today is April 1st, 2009 and represents April Fools' Day -- so readers should be wary of hoaxes and claims at both news and rumor sites today. Today also represents Apple's 33rd anniversary, as the company was founded on April 1st, 1976 by Steve Jobs and Steve Wozniak. April Fools' Day pranks around the web (to be updated): - Adding "&flip=1" to a YouTube page results in an interesting view: Example: Apple's 1984 commercial (flipped) - Google Australia's gBall MacRumors does not participate in April Fools' Day prank news stories. All stories posted today are real. Today is April 1, 2008 and represents April Fools' Day -- so readers should be wary of hoaxes and claims at both news and rumor sites today. Today also represents Apple's 32nd anniversary. Apple was founded on April 1st, 1976 by Steve Jobs and Steve Wozniak. While we avoid tainting our news stories with April Fools jokes, we've posted hidden April Fools' pages in the past: 2007. MacRumored - MacRumors circa early 1990s 2006. MacRumors Page 3 - Mac News and Rumors You Can't Believe April Fools around the web: - Youtube is Rick Rolling their Featured Videos. - Gmail Custom Time - gDay with MATE MacRumors readers should reload their pages if there are design inconsistencies with our page today. MacRumors does not participate in April Fools news stories. All stories posted today are real.